If Killer Elite, based on the novel The Feather Men, teaches us anything it’s that spies and rogue SAS agents like to look in rear view mirrors. Oh, and they sit in cars all day waiting for people. Sure, that’s sort of the point, staying out of sight and all that, but Killer Elite rarely pushes forward with any legitimate tension from those scenes. One, in a hospital parking lot, swerves into a heavy car chase that garners some points, while the rest just sort of flounder around. They chase because they must, Jason Statham hauled into an assassin job by an aging oil baron who wants revenge for the death of three sons during the Oman War. On his heels is another man, part of a secret, bank whoring underground society embroiled in this supposedly-true-but-denied-by-government organization. With a stellar cast and a 1980’s setting that looks little like 1980, Killer Elite keeps the action flowing freely, including a savage hospital scuffle between Statham and Clive Owen. Despite the frenzy of editing and at times incoherent camera work (it’s for effect you see), the brawl marks the peak of the action flick’s energy output. The rest of time it’s mirror watching, or maybe Owen getting ticked off. 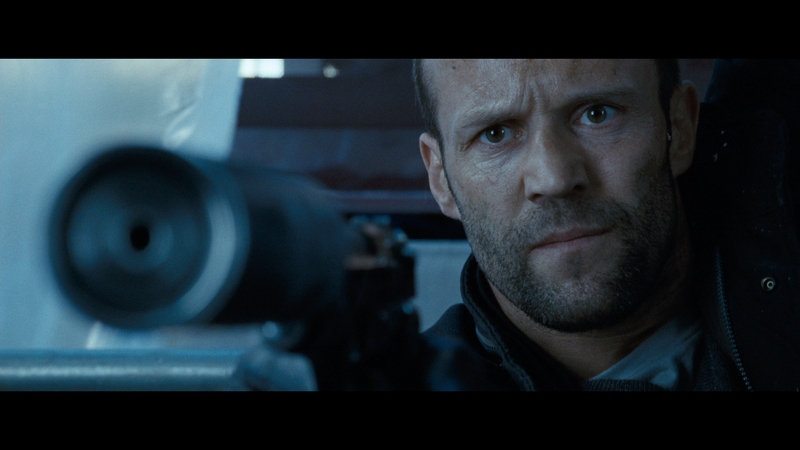 If Statham’s crew is great at watching people, Owen is the best as slamming doors and flipping tables. And no, it has nothing to do with fighting. Cars explode, bodies pile, guns are fired, and the location shooting in Australia continues to breathe visual life into the piece. Eventually, the whole thing feels starved for oxygen, action sits on top of action, and the characters never seem to carry enough life to hold up against the barrage of gunfire. There’s some fun here as a Statham vehicle, if not much else. Killer Elite opens on a slightly desaturated palette, flesh tones carrying a little gray and primaries peaking just enough to be noticeable. It fits the dusty landscapes of these Middle Eastern locales before moving into London where the whole thing ends up chilled to the core. That, or an excuse to bathe the image in monochromatic blue and teals. Whatever the case, it’s creatively void, tiresome, and pale. Universal’s AVC encode is, generally speaking, out of the way. A few walls will ignite with noise, and an aerial shot late in the film seems to be erupting artifacts, Nothing feels manipulated in the home transfer, keeping a solid film stock crisp, sharp, and well textured. Close-ups resolve a fair amount of high-fidelity detail while the mid-range comes across as flat and/or uninspired. Focus will prove jumpy, hampering the crispness by design. Black levels produce enough depth -and consistently- to gain a pass while the contrast remains meek. Unless the image carries a washed out facade, Killer Elite never presses the whites too harshly. That’s surprising considering so much of it is set under a heated desert sun. While there’s little ferocity in the image quality compared to other, more aggressive, actioners on the market, Killer Elite passes with a small spark. Intensity is derived from those beefy close-ups and panoramic establishing shots celebrate their cinematography. Satisfactory work. A bombastic DTS-HD mix awaits listeners, issuing a wake up call just four minutes or so in with a car explosion that swarms the subwoofer and pushes debris into the rears… loudly. Killer Elite isn’t afraid of making noise, relishing each opportunity to do so. No, it’s nothing that hasn’t been heard before, gunfire within closed off walls getting caught with a satisfying ping in the stereos or surrounds. Each round attacks the LFE with an exaggerated bump for effect. Car chases swerve as they pass through the soundfield, and dialogue balances itself out between all of the chaos. Killer Elite does have some special moments though, including a helicopter dropping near a beach that makes quite the racket, and spins depending on the camera angle. An assassination in a snowstorm exhibits some wonderful mixing too, the winds howling for atmosphere in the rears. Thirteen deleted scenes (9:43) are the only extra offered, that is unless you have D-Box equipment or still care about BD-Live.